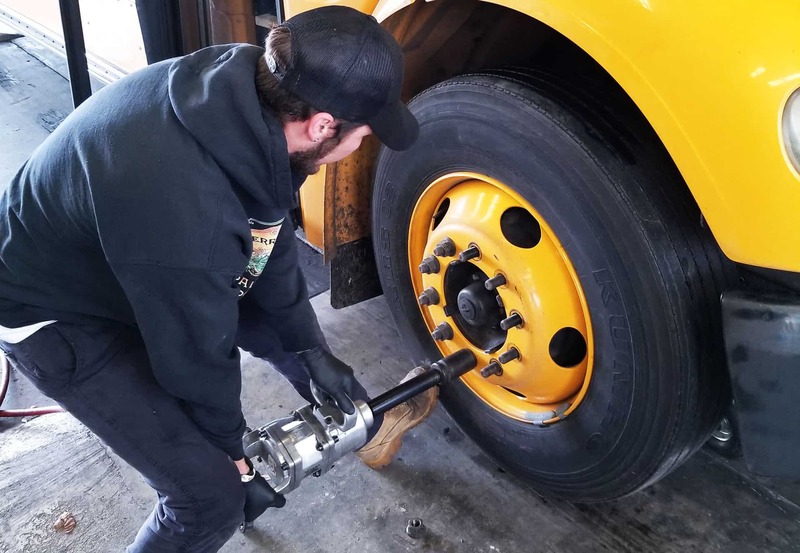 Rising prices for new tires are a concern for district school bus operations, but the prices and need for new tires fluctuate, based on geography, type of fuel, driving habits, weather and other factors. Over a three-week period, School Transportation News received responses from approximately 240 magazine subscribers. The survey focused on mechanics and drivers. Bridgestone recently announced a new price increase on tires, effective on Feb. 1. This is the third tire increase for the company within the past three years. Those prices will increase by 4 percent on Firestone brand truck and bus radial tires that are sold in the U.S and Canada. The previous increase took place after President Donald Trump increased tariffs on various imports from China by 10 percent. However, Bridgestone is not the only tire manufacture increasing prices to meet both operating costs and higher raw material prices. The STN survey showed that 86 percent of districts nationwide responded, and those districts are seeing at least a 1 percent increase on tire prices going into 2019. Nearly half of the respondents said they are paying up to 5 percent more for tires, compared to one year ago, and one-third are paying about 10 percent more. Raymond Manalo, vehicle maintenance manager for Twin Rivers Unified School District in Sacramento, California, said tire prices fluctuate, based on supply and demand. The district is purchasing three different sizes of tires for 2019 and is seeing an overall 5 percent increase across the board. Almost half of the respondents, 48 percent, said they are purchasing 1 to 25 new tires going into 2019. Manalo said Twin Rivers purchases around 200 tires, between their yellow and white fleets, each year. For the yellow school buses, they average 20,000 to 30,000 miles per tire. However, Manalo said that by switching to electric school buses, the district is able to get more years out of its tires. Twin Rivers, to date, has the largest fleet of electric school buses in the U.S. at 16. “The oldest electric bus that we have, is just over 5 years. We’re looking at roughly 50 percent left on the tires,” Manalo said. “So, it looks like we will get a lot more miles out of the tires on the electric bus, as opposed to a comparable diesel bus.,” Manalo said. While fuel type may be a factor for tire tread wear, so is the type of geographical location and type of routes the school buses are driving on a daily basis. The STN survey concluded that 72 percent of districts that responded are anticipating paying 10 percent more for tires going into 2019. Districts said they can predict these percentage costs, due to how much their tire bids increased for this year. Learn more about price trends affecting tires and other school bus parts in the February print edition of STN.